Thakur Anukulchandra (1888–1969) was founder of the Satsang ashram. Anukulchandra was born on 14 September 1888 in Himaitpur village in the Pabna district of Bangladesh. His father was Shibchandra Chakraborty ( Shandilya Gotra Kanyakubja Brahmin) and his mother was Manomohini Devi. Anukulchandra set up a Satsanga ashram, first at Pabna in Bangladesh, and then at Deoghar in India, for fostering spiritual development. The four ideals of Satsanga are education, agriculture, industry, and good marriage. Actually Anukulchandra did not 'set up' any organization. The organization evolved around Him. Schools, charitable hospitals, engineering workshops, a publishing house, and a printing press came up. He never wrote any book. Except one -Satyanusaran' ( The Pursuit of Truth), but this was only a letter to one of His disciples Atulchandra. Howver, conversations of various people with Sri Sri Thakur was recorded, and His direct sayings were compiled. This has given birth to the vast literature of His direct teachings; noted among these are Satyanusaran, Punyapunthi, Anushruti, Chalar Sathi, Shashvati, and Pritibinayak. Anukulchandra was initiated ( called 'Dikhsha)by his mother on behalf of Huzur Maharaj of Radhasoami Satsang, Dayalbagh, Agra. But He had been showing tremendous spiritual signs right from His advent. He used to do 'Kirton'/Naam-Kirton ( "Hare Rama- Hare Krishna"). Sometimes during this, he would go into a trance. His utterances during these trances known as “messages” were later collected and published in a book called Punyapunthi. It was at this time that he started being addressed as “Thakur”. In 1946 Anukulchandra went to Deoghar in Bihar and an ashram came up there on the model of Satsang. He did not return to Pabna after the partition of India, but continued to live in Deoghar, where he left His mortal frame on 26 January 1969.
" The degeneration of humanity began at that moment when the unseen God was made infinity and, ignoring the Seers, the worship of their Sayings began. His teachings range over almost all subjects of the world, including pure sciences. He had predicted & explained the dangers ( in a scientific manner) in 1920s itself. He has given immense knowledge of the origin of the world, humans, history of the world & Indo-Aryans in particular. He spoke in details about quanta, atoms, and sub-atomic particles and has given detailed explanation on how all these created the cosmos. No one knows how He spoke on all these, many of which were discovered later by modern science. His explanations of Human Eugenics laws & dynamics of Varnashram is exhaustive. He has said that we must know the science of human breeding, to produce better quality people. All His principles are based on Ayurveda & other Vedic concepts. But His explanations are surprisingly modern. He said(Ref:6) that the Aryans originated at the North Pole when the climate there was spring-like. Later, due to relative change in postion of the sun ( as is happening again around/since 1945, He warned), glaciation started in Arctic area. The Aryans had to migrate southwards. Ural, Lithuania regions saw their immigration. Much later, one of the branch of the Aryans immigrated to the Saraswati-river basin. That branch is now known as the Indo Aryans. According to Sri Sri Thakur, the Vedas were expressed at the North Pole itself. The Aryans were practitioners of the Varna system and had a proper science of marriage. This was based on genetics & eugenics. 1. GOD is one and all Prophets are the same. The Latest Prophet is always the Fulfiller of all the previous prophets.He said Ram, Krishna, Jesus Christ, Mohammad, Chaitanya & Ramkrishna Paramahans have been the Prophets & we should respect them all. Blasphemy to anyone of them is blasphemy to all. 2. Living Ideal ( Guru in flesh & blood/ a living Guru). He said that the abstract God can not be comprehended by humans. So, we need a living Guru who has the attributes (some, if not all) of God. This Guru is the living embodiment of all ideals of life. When a Prophet comes He is called Sad-Guru, the most perfect Guru, and blessed are those who get such a Prophet. This chain of Prophets will continue as long as the creation exists. 3. Marriage on the priciples of Varna system. That is first marriage of a man in his own varna ( Savarna Marriage), then he can marry females of the lower varnas ( Anulom Asavarna marriage/ Hypergamous marriage). The former is to preserve the original genetic stock of the lineage, and the subsequent ones to breed new bio-diversities. But he warned against Hypogamous ( Pratiloma) marriages, where the girl is from higher varna. Progeny of such marriages are distorted by birth, as, Sri Sri Thakur "inferior sperm destroys the nodules of a superior ovum". These people, however brilliant, are anti-existence, anti-life by birth, and can not be cured. 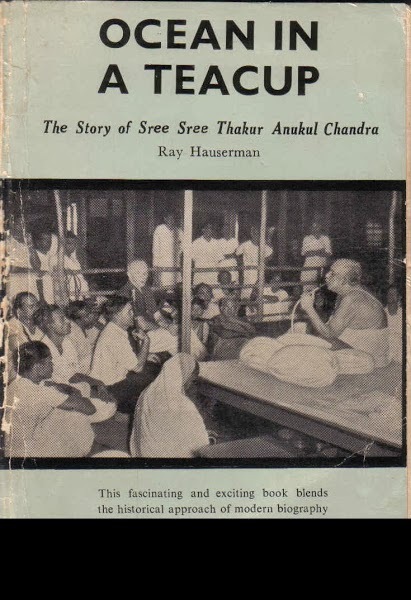 His biography in English, titled "Ocean In a Tea-Cup: Story of Sree Sree Thakur Anukulchandra", has been written by Ray Hauserman. In Bengali, there is one biography by Brajgopal Dutt Roy. In the nineteenth century Sri Sri Thakur came in a remote corner of a village named Himayitpur which is at present belongs to the domain of Bangladesh. At the time of His birth the natural environment of Himayitpur was too near to the primitive stage where tigers, bears and poisonous snakes used to roam freely in the primitive streets of the village of Himayitpur even during day time. The village of Himayitpur was situated on the bank of the river Padma, where crocodiles used to float on the surface of water freely and safely even during day time. In the midst of all His brothers and sisters He was brought up like a common child by His parents who used to fight against poverty and wistful, immature cravings of self-fulfilment of the environment. The greatest miracles preceived by this environment during His life time is that He never showed any contradiction in His whole life even in any of His "Banis" (utterances) that He uttered for others and He always said that there's no miracle in this Universe. Every action has got a scientific truth behind. Miracles appear in front of us when we cannot feel the consequences of the events. So today's miracles very often come to a reality by tomorrow when we can feel the consequence of the same. In His boyhood of six to seven years this compassionate adoration surpased the zone of His family into all the families, who resided at that time in Himayitpur village. According to the specific nature of human beings major portion of the people of Himayitpur used to exploit His goodness thinking Sri Sri Thakur a foolish chap and a few others used to love Him for his soothing conduct and servicing mentality. In His infancy, once the governess of Sri Sri Thakur synonyned His stature as Sri Ram Chandra's infancy in her mind. Immediately, the colour and texture of Sri Sri Thakur's skin became light green like that of the colour of Ram Chandra in Ramayana. The governess became bewildered and thought again about Sri Krishna's childhood. In her utter surprise she found that His texture of skin changed into blackish blue as depicted the Mahabharata. Sometimes in His stammer tongue He used to tell about the future of any individual which appeared absolutely true for him. In a little advanced stage of His childhood He used to swim in the river Padma alongwith the crocodiles. Very often He used to go deep to the bottom of River Padma to practise meditation for a pretty long period where he never felt any discomfort due to cessation of respiration. In his advanced boyhood His education started. In the beginning of His education the mathematics teacher tried to teach Him the fundamentals of Mathematical summation i.e. 1+1 is equal to 2. But Sri Sri Thakur with all His modesty told the teacher that everything is unique in this world. So, one plus one should be two ones instead of two. With this comment He whetted the anger of the teacher and in turn He was scolded and caned which was a routine technique of teaching in those days. In those days He used to repeat the Name ( Holy mantra) taught by His mother almost twenty-four hours unknowingly. In that stage of repeating Name once He touched the carcass of a cockroach, the half of whose body was devoured of by the insects. As long as He touched the cockroach's body it behaved like a living cockroach. From that experience Sri Sri Thakur thought Name can impart vital life-thrill which may bring back the life flow in a lifeless body. In His later life in the same way He used to infuse the life thrill in so many dead human beings. The foresaid experience, inspired Him to think about a machine that is "Vibrometer" which can measure as well as impart the vital life thrill into a dead body. He went to deposit the examination fee for matriculation and found a needy friend by His side who had no money for appearing in the exam. He immediately gave His hard earned money to His friend so that he could appear in the said exam depriving Himself from the same. In His teenage, He took initiation from His mother Monmohini and since then very ardently He used to appeal to the Almighty for appearing in front Him in a glorious stature.With this appeal to the Almighty and restless stature He passed years together when on a dark night, He viewed a glorious illuminated palm where all the unseen things and darkness devoured up in front of His eyes with that eternal soothing emanation of that palm. He used to specify that palm as the palm of "Parampita" that is the Creator, Father of the Universe. He used to co-relate His knowledge with the events in the environment and nature around Him. He had a fantastic power of storing them in His memory and to utilise them among others for their well being. Almost miraculously from the dew-dawn of His life till the dew-dusk of His existence He used to say that all the living creatures belong to one family and you'are amongst them for the well-being, comfort and better livelihood of others. You shouldn't forget to spend each one of your aptitudes to uplift your circumstances for better livelihood and tranquillity. Beholding one's existence in expansion and exaltation is "Dharma". To achieve this goal, the processes that lead up to the goal vary according to the environment, time and place. But the principle uplifting individual remains the same unalteringly in every age, class, creed and nationality. Accoding to His view the path of religion is one in this glove. Decisions to reach the path may differ. Defulcated souls so many times roam in the faulty paths to achieve glory and peace. Religion re-ligers them into their right path to achieve the same what they really want in the shortest possible time. So the man whose go of life plots geographically and historically that eternal path of religion and whose life tells the story of the same is undoubtedly called an incarnation of religion. It goes without saying that our Sri Sri Thakur Ji belongs to the first line of the above said category. With the advancement of science Sri Sri Thakur's life, following the laws of nature, reached the advancement of His life. More and more people started flocking together around Him. His power of love expanded from His village to the whole province of Bengal and ultimately overflowed to the other neighbouring provinces till millions of people of India started feeling Him as their Love-Lord as because the power of Love is many fold stronger than any fusional bombs. Centering Him so many projects like "Post graduate research centers, Vishwa Bigyan Kendra", Art studio, craft manship centers, Tapovan School, Thermal power center etc. started developing at Himayitpur till He left Himayitpur, just before the partition of India, for Deoghar, Baidyanathdham, Bihar(now Jharkhand). He left almost everything with all those previously mentioned projects whose valuation was approximately more than two and a half crore rupees(Indian Currency) at that time. At Deoghar His next phase of life started with the world, where delegates of various countries used to come to Him to receive His shower of love and to know the eternal, unaltered, exalted and beautiful flame of Truth which remains same for all the day and in all parts of the Universe. Very often in His youth He used to remain absorbed in "Keertan" where the descriptions of "Almighty" were uttered in melodious songs. At that specific time in an unconceivable physiological process His body temperature used to rise above 110F. Cessation of His pulse indicated the retardation of heart beat. In that Trans Stage He used to proclaim the specificity and uniqueness of "Parampita" is various languages of the Earth. Out of those languages only a few of them uttered in Bengali, is printed in a book named "Bhab-bani", and later on, while discussing about the Trans period Sri Sri Thakur used to tell us that He felt as if He had been expanded to bear the whole Universe in Him. He is responsible for all the event happening in any part of the Universe. His most uncommon perceptibility centralises in His body in such a way that He felt His existence among all the living entities around Him. In that specific stage of consciousness a horse was caned in front of Him and the cane marks on the horse's back appeared distinctly on the back of Sri Sri Thakur Anukul Chandra. In His last days, very often He used to say "I am the foolish Father of my foolish sons and daughters who don't know how to achieve those things that they really want. The booming commotion of Existence that rolls, in the bosom of the Beyond, evolves into a thrilling rhyme, and upheaves into a shooting Becoming of the Being with echoes that float with an embodiment of Energy- that is Logos, the Word, - the Beginning! Inspite of giving such revolutionary teachings & science which could have given a new & positive direction to moderncivilisation, Sri Sri Thakur Anukulchandra left His mortal frame in a dissatisfied mood, as He could not get a single person, among His disciples, who could become as He wanted. He regretted that "ekta manush pelam na" ( I didn't a single man !). 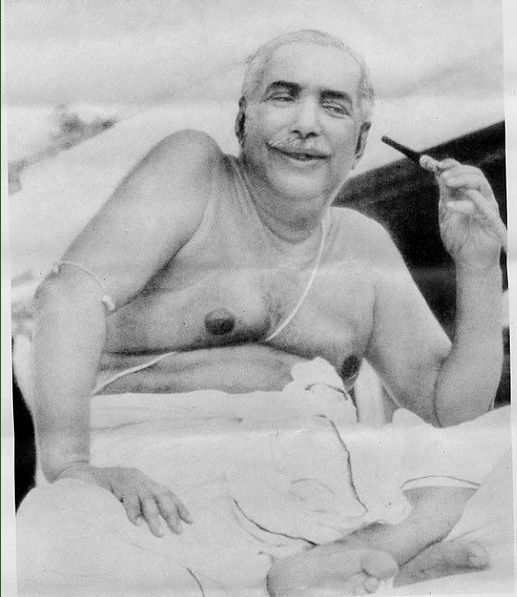 Many of His eminent disciples, like Ray Hauserman(Ref:9), Debi Prasad Mukherjee(Ref:10), Prafulla Kumar Das, Justice Prafulla Banerjee( Ref:7) and His own second wife Sarbamangala Devi ( Choto Ma) heard Him telling that He would take birth again, as the son of His youngest son, to practically implement His teachings in the society at large. Sri Sri Thakur Anukulchandra had 6 wives. Only the first three of them had children. The first wife, Shodashibala Devi ( Boro Ma) had two sons ( Amarendranath Chakrobarty, i.e. Boro Da & Vivek Ranjan Chakrobarty, i.e. Mejo Da) & a few daughters. The second wife Sarbamangala Devi ( Choto Ma)was in fact younger sister of the first wife. She had only one son, Dr. Pracheta Ranjan Chakraborty ( Kajal Da). Dr. Pracheta Ranjan Chakraborty is at present the only surviving son of Sri Sri Thakur Anukulchandra. The third wife had a daughter. After passing away of its Founder, as it happens in all organizations, the Satsang organization of Deoghar also saw acrimonies. Vivek Ranjan Chakrobarty & Dr. Pracheta Ranjan Chakraborty did not appreciate the ways of their elder brother Amarendranath Chakrobarty, and set up another Satsang organization with Vivek Ranjan Chakrobarty being its President. Later, these two separated their official collaboration without sacrificing the main mission. At present Dr. Pracheta Ranjan Chakraborty is the only surviving son of Sri Sri Thakur Anukulchandra. He lives in Deoghar and also practices in Kolkata. He is an eminentsurgeon. The original Satsang organization, thus, has assumed two separate forms. The first, which is the biggest in size & number, is headed at present by Ashok Chakrobarty, the eldest son of Amarendranath Chakrobarty. Ashok Chakrobarty is called Pradhanacharya. They have almost made it into a hereditary system that the eldest son will be the Pradhanacharya. This organization has spread all over with numerous temples all over India. Dr. Pracheta Ranjan Chakraborty ( Kajal Da) has only one son , Ananyachandra Chakrobarty ( Bapun Baba or ANANT SRI BABA).A large number of people follow HIM as their Sadguru, as they know that Sri Sri Thakur Anukulchandra had predicted that He will be reborn as the son of His yongest son. Surprisingly, this is also mentioned in the Bhrigu-Samhita astrological readings of Sri Sri Thakur Anukulchandra. These readings were brought from Kashmir in the lifetime of Sri Sri Thakur Anukulchandra. They say- "Laghu putrasya grihe punah” i.e. readings of Sri Sri Thakur Anukulchandra will be reborn as the son of His youngest son ! Ananyachandra Chakrobarty ( Bapun Baba or ANANT SRI BABA), born on 15 January 1971), became very disappointed to see the acrimonies in Satsang organization and lack of will & real action to do works as wished by Sri Sri Thakur Anukulchandra. He became disappointed with all, including His own father. Not willing to make any compromises, HE severed all connections with all branches & sub-branches of Satsang organization. Now, He is working the way He wants to. As He is still young, its the future which will reveal what HE does. in an appropriate harmony. " "I feel," Thakur began, "the clue to real religion concentrates in the character and conception of the Love-Lord. It can be realized only through a concentric zeal, love and service to Him, the Universal individual. After all, each Advent, Avatar, Son and Friend of God are the same, though in different embodiments. Their tidings are of the same tune, though in accordance with the age. So, refute none, though you follow One. To do so, I believe, is a curse on the followers and blasphemy to the Prophets." "Blasphemy, Thakur ? You make it sound terrible." Thakur's eyes became quizzical. "Since Providence provides the Prophets and Prophets profess the law, and further, since the only way to achieve is to follow and fulfill Them, then, is not conflict and animosity with any of Them a blasphemy, a satanic proclivity?" "You keep insisting all the time that the Prophets are the same," the young woman said. "Perhaps they are. But why in their profession of the law did they so often proclaim contradictory things?" "Though the Prophets are One, " Thakur explained, "two aspects, divine and discrete, always exist. The divine is eternal, universal and invariable. The discrete varies according to time, place and circumstance. So, specific situations may mould the creed in many forms, yet the law and basic principle of uplift always twinkle in equal radiance." "What are those laws and principles that are equal in all?" "I feel, to uphold, nurture and protect existence with an apt resistance to evil are the four attributes of divinity. There, God smiles with every blessed bliss. Further, I believe that love — the nectar of the Omnipotent, dwells in every heart." "Love, Thakur?" the serious youth intervened. "Right here there's confusion. The theme of the Hebrew Prophets and Mohammed was fear of God's wrath; while the basic principle of Christ's faith is joy in God's love. Don't you find these different and more than just a question of time, place and circumstance?" Thakur shook his head as he replied. "I feel that fear and hope lead the mind to knowledge. Then, mercy and love lead to achieve. All Prophets made love prominent and a basis for their leaching; for it leads us to achieve and sublimate our souls normally. Thus in the Tidings of the Hebrews it is said:'... Love is the beginning and the end of the Torah. . . ' and Mohammed has said: . . . 'if you love Allah then follow Me and Allah will love you . . .' So, don't ever slur any Prophet with a delimiting imposition, lest it lure you to be fixed in unhealed fixity." Unconvinced, the youth insisted, "But the way Christ, Buddha and Krishna emphasized love makes me feel there is certainly a difference in quality if not in content." "See," Thakur said pointing towards the moon in the eastern sky, "the moon that rises tonight is the same moon that rose yesterday and will rise tomorrow. After a few days, that half moon will appear to us as a full one. Yet, the full moon we shall see is really the same as the half moon we see now and the same moon that rises every night. It is only from our view that it seems larger or smaller. Practically, it doesn't change its size at all. Every night it's the same moon. So it is with Advents, Prophets and Son of God. Though They are complete in Themselves, yet They show it according to the situation, the time and the place. Remember, He is always unlimited and according to the devotion and the attitude of the followers, a particular aspect appears prominent." "Thakur, still there is that statement of Christ's: ' . . . none come to the Father but through Me ..." This makes it difficult to accept other Prophets." Thakur replied , "But 'Christ' means 'the Anointed.' Hence, all real Prophets are Christ since They are anointed with the love of the Supreme Father that dwells in the life-spirit of every being. This is the reason I feel, Christ declared: ' ... I am before Abraham was. . . ' as well as '. . . none come to the Father but through Me'.. . "
A thoughtful silence ensued until the young man with spectacles remarked, Thakur, we were discussing at suppertime about the comment of the great contemporary historian, Toynbee, that perhaps a new universal religion might come from Asia, possibly from India . . ." The young man paused and his companion intervened, "Thakur, Christ said that as lightning cometh out of the east and shines unto the west, so shall be the coming of the Son of Man. Some people say that in this age of nuclear bombs, we now live in an apocalyptic age. Even some remark about the fact that all the great religions predict a saviour to come. The Hindus wait for Kalki Avatar; the Buddhists pray for Maitreya; the Mohammedans for Muntazar; the Christians look for Jesus' second coming and the Jews still seek for their Messiah." ".. . Thakur, what they're trying to ask is that if the Saviour is to come, when will He come?" the young woman insisted. "They want to know what you say." Thakur's voice grew grave. "I believe it is when ominous tyranny tutored with hellish, hoe through python push of desire, reigns with ramming blow; when life grinds and groans with gnaw of despair; when soul rebels and sobs with panting urge; then, I feel, blissful God comes down with His stretching arms." "God comes down ... ? How does He come, Thakur?" "As I understand," Thakur explained, "the Son of God, the sudden mutation, is invoked by the anguished, concentrated urge of the people. He then is conceived and born as the Prophet. He is, I believe, the miracle in flesh and blood Who shoots from above for the people below." "Gee, Thakur," the young woman remarked, "there are an awful lot of people all over the world who are weeping and crying and afraid. Do you think He's come already? If He has where has He come?" When Thakur had taken his seat under the vine-encrusted banyan tree, one of the young American visitors observed, "You describe the possibilities of family life as 'a glimpse of heaven'. However, Thakur, in many families, even those without any history of divorce, the home is rather distant from the picture you describe. All parents in America seek happiness in marriage; they desire loyal, intelligent children who might bring credit to themselves and their family. Yet, often it seems that we have failed somewhere. The children are given the best education that money can provide health, opportunity ... nothing has been left out. Yet, many times the children neither utilize those opportunities, nor do they develop in the way we hoped. On the other hand, it is found that children who have had much less opportunity do achieve and contribute far more to family and society. When I seek for a cause, I become confused. Then I end up either blaming fate or giving credit to luck." Thakur nodded, "I say, don't ignore the law of begetting which requires that traditional flow of characteristics that contributes to life's becoming and transmits through the matching of similar heritage to sprout into hereditary specifications which generate finer feeling and instinct. If this is ignored, one commits a suicidal offence which gradually affects family, state and society with a mongrel manifestation. Then, a luring whistle of passionate dream infects every heart and home —educated or illiterate—with a dissipated, luxurious go." "Perhaps that kind of degeneration is the fate of all civilizations, Thakur. In fact, one philosopher has suggested that civilization itself is a disease that is inevitably fatal." Thakur shook his head. "No doubt, when civilization ignores the eugenic, uphill evolution of existence, then non-virile intelligentsia, lacking valour, traditional traits and far-sightedness, and infected by injudicious unrestrained passion, often contaminate the majority of the people to roll down with vulgar steps. Then, I think, civilization is attacked with the disease that diminishes it to insignificance. But, if one protects his family and civilization through proper, compatible marital ties that nurture the various, distinctive genes so as to maintain an evolving efficiency, then, I say, hearts do upheave and civilization does soar in a growing expansion eternally." " Thakur, that sounds all right," the young woman remarked, but human eugenics flies in the face of a democratic way of life. Fundamental to democracy is the free choice of not only one's rulers, but also one's marriage partners—regardless of eugenic compatibility. This free choice is considered a basic premise in man's inalienable right to the pursuit of happiness." "Yet, it is my belief," Thakur explained, "that incompatible marriage often makes the morale of morality lame and lurid. Family and society then sigh in the tussle of conscience and consequence. Whereas, stable, well-cleaved eugenic life that sprouts from the matching of bio-psychic compatible mates is truly the pursuit of happiness which shines with brilliance to beget progeny of talented glory surrendered at the feet of heaven. Is not this the fundamental of happiness in family, society and slate?" "Perhaps it is, Thakur," the woman agreed, "but what do you mean by bio-psychic compatibility? How can one recognize incompatibility?" Thakur nodded. "I have seen that certain organic compounds fulfill specialities of others when combined, while some combinations become unstable or malformed, their original qualities are lost due to electric maladjustment. Similarly, the individual characteristics, family traditions and traits of wife, if not fulfilling and nurturing to the husband, break the original tenor and tune of each. Often, to blunt and distort the nervous system of the offspring and make them repugnant to their ancestral culture, sentimentally peevish and stubbornly unbalanced. Whereas, proper bio-psychic matching makes the inherent, instinctive tendencies of both complements and fulfill one another to beget mighty off-shoots of spontaneous, intuitive, educative traits." The girl shook her head. "I still don't understand bio-psychic traits, Thakur. Everyone has literally millions of traits and even these vary at different ages and under different circumstances. The possible permutations and combinations are almost infinite and to judge which fit and don't fit is practically impossible." "At least," Thakur observed sympathetically, "don't support or nurture the matching of a woman of ancient, noble, cultured gradation with a man of more recent one—however brilliant he may be. I believe such unions fuse in fragile frailty, disrupting the delicate characteristics of each and almost inevitably beget progeny that integrate in a devilish distortion who, in turn, drag society down to the boisterous hell of disintegration." The white-haired, scholarly visitor smiled. "Havelock Ellis has remarked somewhere that Lady Chatterley would not have been a happy wife to her peasant lover. This observation seems to agree with your idea, Thakur. However, the problem remains: A democratic society cannot accept any class distinction or recognize superior or inferior. They feel it smacks of vanity and arrogance." "I don't understand arrogance or vanity, but what I see I say. I observe that each person is a unique empire of Providence, and to goad him from his normal trail of aptitude is to outrage the path of his instinctive existence. Thus, you lose an empire for yourself, your society and your state. Then, the echo of that lost existence comes back as suffering to rupture the roll of life with an indolent dullness. This is why I say: Don't declare or do what you do not like for yourself. Don't make another a loser and don't be a loser yourself by demolishing the definite, distinctive arrangement of existential evolution that draws us toward the of existential elixir." I gir’s forehead wrinkled. "But . . . but, Thakur. . . doesn't THE definite arrangement of evolution stand upon the premise of equality ? Don't you believe in equality?" "I don't believe," Thakur explained, "that the conception of equality can create intelligence, because it seldom differentiates one from another. Often it creates a fantastic, foggy conception with a frivolous, dull exposition that dwindles the inter-interested go. I like the sense of equitability— the capacity to distinguish between similarity and sameness— that generates fellow-feeling and sympathy." "But, Thakur, do differences make for fellow-feeling? Generally, it is just the opposite.” Thakur shook his head, "Just think: if all had been equal, then the feeling of 'I' as different from others would never exist. If there were no 'you' there could be no I. That is why I feel that though the urge for existence is one, the process of existence is many. Hence, each unique existence can only acquire from another life entity a meaningful, piling adjustment of knowledge through his own distinctive aptitude." "What on earth do you mean by 'distinctive aptitude'?" "I understand," Thakur began, "that each being comes into this world with specific, instinctive characteristics handed down through generations—the immortal necklace of germ cells. It is through this individual distinctiveness that man's existence is upheld and through it he finds, and ultimately feels, the underlying unity in creation. In a word, he then reaps the harvest of existential proficiency. On the other hand, to break or belittle this trail of instinctive, normal aptitude through ignorant nurture or incompatible marriage is to make the inner man suffer in a passionate, slavish, suicidal trap. In a word, he reaps the harvest of hellish deterioration." "Then, Thakur, you have to give more importance to one individual than another!" Thakur shook his head emphatically. "But I believe that no man is less important than another in the field of his normal aptitude, be it philosophy, administering or farming. I understand that every aptitude is provided by Providence to further the fulfillment of existence. So I say: don't minimize the labour or skill of anyone, but keep open the way for each distinctive aptitude to maintain and evolve with active enthusiasm and determination. Thus, insure the evolving life of everyone—yourself, your neighbour, your society and state." "Do you actually feel that's possible and still maintain the ideal of democracy, Thakur?" Thakur said, "Just face the fact both analytically and synthetically with earnest inquisitiveness and wistful intellect. Seek for the common factor and nurturing mechanism in each and every existence. Thus, acquire and systematize a knowledge that includes all differences and similarities, actions and interactions. Surely, you will distinguish through graduated perception, the shining door where varieties and variations meet in the university, all-wise entity. And even more, you shall embrace the goal of Democracy that is Divine!" The elderly scholar became thoughtful. "Thakur, a number of groups in various parts of the world have sought to find ways and means to apply eugenics to man. Few, if any, have had any success. Human eugenics, I'm afraid, is a field that at one time offered much promise, but has produced very little practically." "Still," Thakur softly insisted, "it is my faith that though we fail a thousand times, yet when one favourable point that fulfils life’s hankering to evolve is discovered, it allows thousands of individuals to gain. So, why worry or mutter of inability or unsuccess ? Why not exercise and administer to gain that point even amidst the thousand failures that cry around you?" The visitor smiled. "As a matter of fact, Thakur, a prominent contemporary physician in America has recently suggested that each individual maintains a record of the history of the diseases in his family as an aid to diagnosis and to the understanding of the place of heredity in diseases." occupational history, it would help to lead to a solution." "Still, Thakur . . " the young woman's brow was puckered up, "this emphasis on heredity, on distinctiveness... somehow it just doesn't seem right. It places a kind of limitation on us as free children made in God's image. We might have limitations. But, to emphasize them. ... to . . .to insist upon them, denies democracy and even belittles our faith in God, don't you think?" Thakur's voice was gentle. "I think that if one desires to go beyond the limitations imposed by nature, he has no choice but to go through them. It's why I feel a man must stand upon those distinctive traits bestowed on him by heredity and nature. Then, through devoted adherence and sustained effort to fulfill his Lord, Who is the Fulfiller of each according to his characteristics, he eventually comes to realize the universal One. He extends that original line indefinitely-like a parabolic curve." The wrinkles in the forehead of the girl seemed to soften as Thakur continued, "In our scriptures it is said a menial or a king can know Brahma, but not by discarding his instinctive traits, rather by standing on them. Such realized persons are true Brahmans and men have always worshipped them. This is why I feel each of us must stand upon our own distinctive characteristics, for only then can we keep the way to further evolution open. Only then we know no end to our possibilities. For as God is the source of unlimited energy, so is man if we maintain intact our link with the Source. For God did create man after His own image." The girl had grown more thoughtful. "Still, Thakur, there's another problem. Who's to judge what the distinctiveness of a particular person is ? And even more, how to know which distinctiveness of what man is compatible with which distinctive-ness of what girl... well, it seems terribly complicated." Thakur nodded and said, "I think that tabulated knowledge, scientific test, careful observation —the accumulated acumen that unfolds the matching point, who matches with whom producing what—will inevitably evolve accurate, existential standards. And when it is an experimented fact, everyone will follow, for do not all men seek their welfare ?" The young man who had been silently listening intervened: “ Thakur, a western historian has observed that 300 generations cover the history of Western civilization and ten generations suffice to create fundamental changes. Further, he has suggested that a single generation represents a critical moment of history ..” youth glanced at his friends and then added, "I was just wondering how long you feel it would take before noticeable results were achieved by introducing some of these eugenic considerations into marriages. Often, the fact that biological change is so slow and imperceptible, it fails to secure widespread support or sympathy." "Six to eight generations!" The girl's eyes widened. "Why, thats practically two hundred years. That's too long, Thakur." A trace of a smile played on Thakur's lips as he replied. “ That’s why I feel that now is the time to select and sow with care the seed of the tree that can bear the fruit which will flourish existence later. Then, it is sure, your future progeny will find that a glimpse of heaven on earth has appeared to them automatically. What is more, the heart of your posterity will flood with gratitude for your farsighted fulfilment of existence!" "But, Thakur, this law of begetting. How to know where to start.. . how to begin?" "Just teach your offspring when they select their mates to consider with a careful observation at least these aspects: compatible culture and conduct; health and hygienic go; hereditary diseases, physical and mental; compatible educational and occupational efficiency." "Thakur, that doesn't sound so bad," the girl's face seemed reassured.